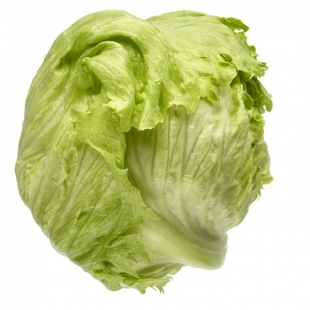 Iceberg lettuce is a variety of lettuce with crisp leaves which grows in a spherical head resembling cabbage. Iceberg lettuce has a mild flavor and firm, crunchy texture, making it a good choice for salads and sandwiches. When used in combination with other varieties of lettuce, iceberg lettuce will contribute a pleasant crunch to salads. Moreover, its uniform, pale-green leaves make iceberg lettuce an easy product to work with, making it a good choice for sandwiches. Another positive aspect of iceberg lettuce is that it lasts a long time in the refrigerator, making it an economical choice since it minimizes spoilage and waste. Iceberg lettuce is regarded as being a food that doesn't offer much nutritional value, but this is somewhat of a misconception. Iceberg lettuce is a good source of fiber, potassium, calcium, vitamin A, vitamin C and iron. Even so, iceberg lettuce has relatively few calories by weight because of its high water content.